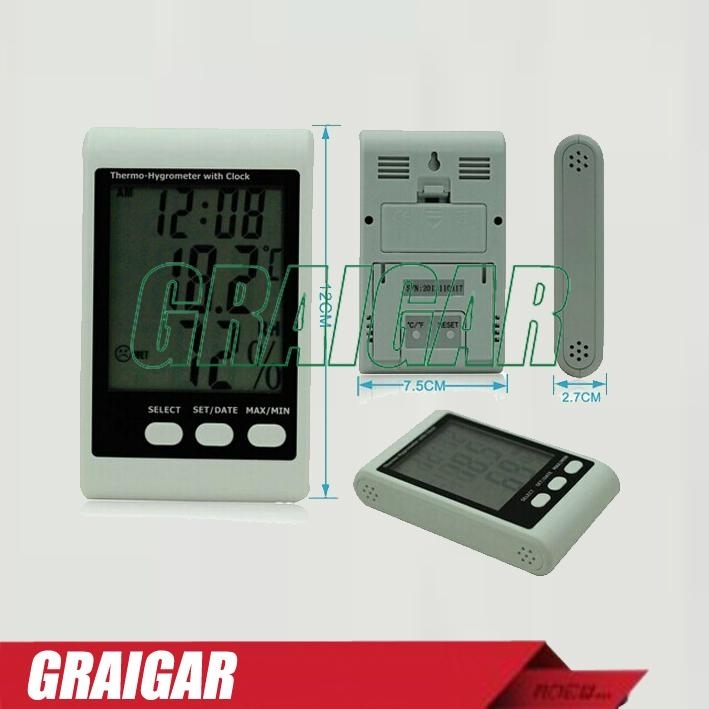 Congratulations on your purchase of the indoor high precision thermo-hygrometer. This instrument is a portable easy use and compact. Built-in thermistor as temperature sensor, hygristor as the humidity sensor with excellent long term stability. Best for use in factory, storehouse, hospital, laboratory, office or home room, etc. It is recommended that you read the user’s manual thoroughly before operating the units. 1. Characters displayed on the LCD panel will appear lighter and darker depending on the viewing angle. 2. The LCD display may become dull in low temperatures, and darken in high temperatures. 3. Do not touch the screen of the LCD panel with your fingers. This may cause the screen to become dirty. 4. If the LCD panel is left in direct sunlight for an extended period of time, the screen may turn black and become impossible to read. 1. This may result in injury or damage that the user attempt to take apart, modify or repair the unit. 2. This product is not waterproof. Do not immerse in water or allow to come into contact with water or rain. 3. Do not use in areas where there is a lot of dust. This may result in damage. 4. Do not touch with wet hands. 5. Avoid any strong shocks or jolts to the product. 6. Do not expose the product to direct sunlight for extended period of time. 7. Place the product where children cannot reach it. 8. Wipe with a soft cloth dipped in neutral detergent. Never use spray cleaners, benzene or thinners. 9. This product is not suitable for medical or industrial use. Please refer to it as a guide for temperature and humidity levels during normal everyday use. · Temperature display in ºC/ºF with MIN./MAX. records. · Humidity display in % R.H. with MIN./MAX. records. · All MIN./MAX. recordings can be reset. · Comfort level indicator : “COMFORT”, “WET”, “DRY”. · Calendar, alarm clock, announce hour and 12/24 hours system clock. · Wall mounting or table standing. Humidity measuring range : 10% ~ 99% R.H.
0~70% R.H. with battery removed from meter. Converting between clock and alarm clock. Setting clock and calendar or alarm clock. SET/DATE: 1. Date indicates at clock mode. alarm clock and announce hour on/off. the MAX. or MIN. records. ºC/ºF : Selecting the temperature display in Celsius or Fahrenheit. Open battery cover, Place 1 x AAA, IEC R03-1.5V battery into the compartment. All segments of the LCD will light up. 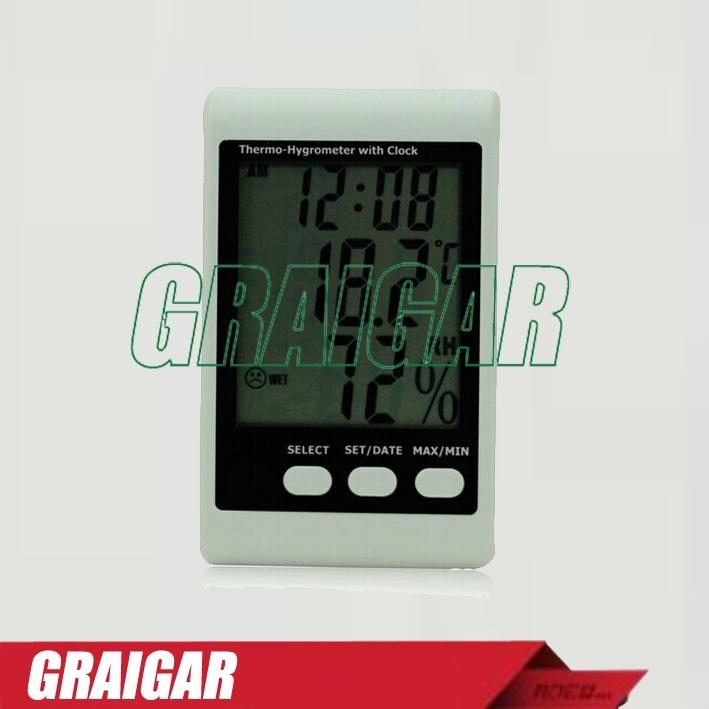 The indoor temperature, humidity level, time will be displayed.